It’s been just over two weeks since starting the knee high Kalajokis, and there are about two and a half weeks to go until the Bendigo Sheep and Wool Show. I imagine there have probably been some sleepless nights as people worry about the status of my socks. Fear no more, for here is an update! The Patonyle 8ply I’m using is lovely and soft, but I probably prefer Allegro for this pattern. 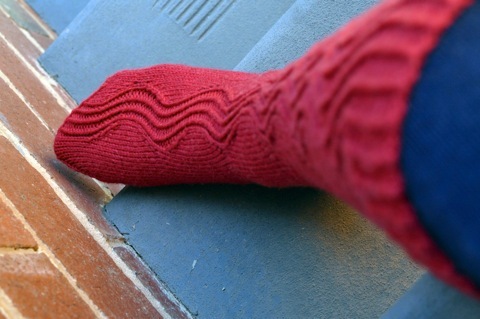 Allegro’s tight crepe construction just feels sturdier, and the ribbed ‘river’ pops out a bit more. 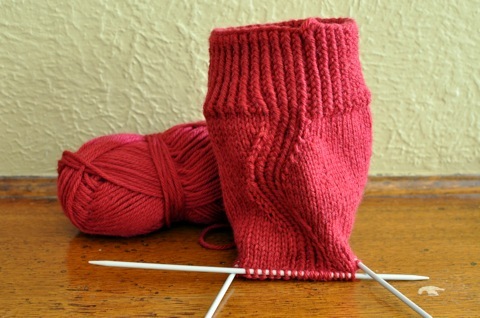 That said, I’m really happy with how the socks are turning out in Patonyle; they’re thick (perhaps even too thick for my boots) and warm, and it’s a really great red. these are so amazing! what a stunning pair of socks thee are going to be. while i completely understand that the only way to get a pair of socks finished is to, you know, knit them, im a big fan of multiple WIPs. i usually have socks, some lace and a garment on the go at once. its all about the balance right?! They’re looking good and they’ll soon be done. Can’t wait to see them in person. They do look gorgeous and smooshy! oh my lord. Oh wow. Breathtaking. I wasn’t losing sleep over the first one but my goodness I think I might be over the second one. FINISH! FINISH!